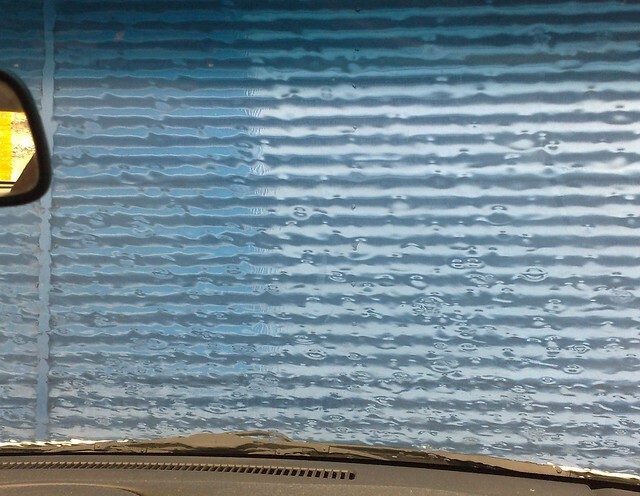 I rather liked the pattern made by Officeworks’ corrugated wall combined with today’s rain falling on my car windscreen. Of course, it looked better in real life with the rain drops dripping down. It just took almost two and a half hours to drive from Glen Huntly to Footscray. Here’s why. 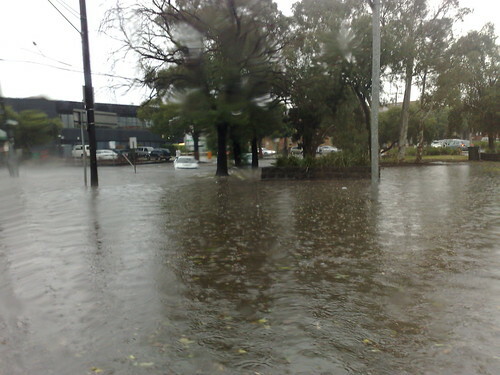 Glen Huntly. 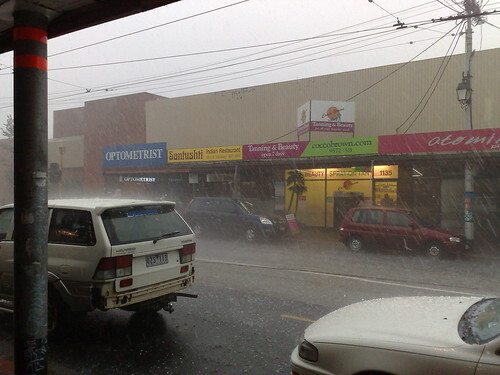 The hail was bouncing off the cars. 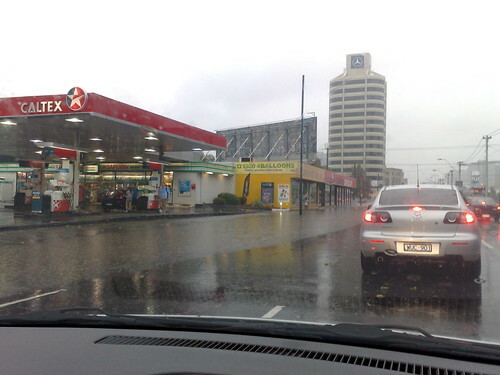 Kingsway wasn’t pretty — much under water, traffic lights out, and lots of traffic. 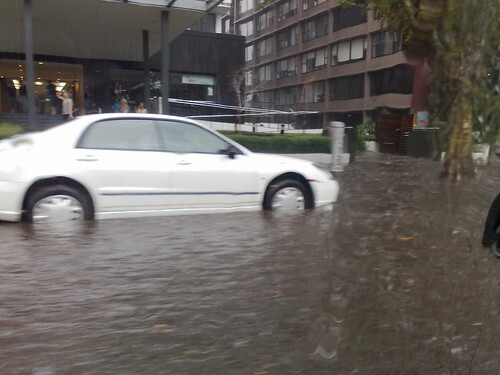 This street between Kingsway and Sturt Street/Eastern Road had a couple of cars which will have water damage. 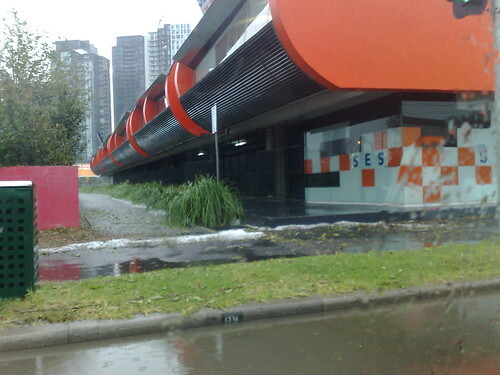 All was quiet at this SES building in Sturt Street. Perhaps they were all out on calls. Note the hail stacked up by the building. Update 9pm: Show pictures individually. 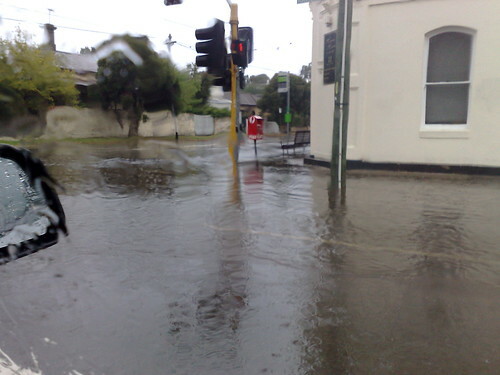 One of the things you really notice as a pedestrian in wet weather is low-hanging branches over the footpaths. I don’t know if the wet weather we’ve been having causes the trees and bushes to put on a growth spurt, or it’s just more noticeable because every time you brush against something lots of water falls on you, or because it’s harder to avoid head collisions while dodging puddles and holding an umbrella, but it’s been particularly apparent the last couple of days. Yesterday afternoon I went out with the clippers to ensure the tree outside my house that overhangs the path isn’t in anybody’s way. Of course, I shouldn’t have done it straight after it had been raining, as it resulted in masses of water showering down on me every time I nudged a branch. But oh well, anybody walking down my street (and we don’t get heaps of traffic, foot or otherwise) can rest assured, they won’t have to duck when passing my house. It’s worth a few minutes’ work to make life easier for my fellow pedestrians. I must check if there are council bylaws about this kind of thing. Checked your overhanging trees recently? Amusing personalised number plate: “AMLOST”. Heh. One day, train commuters are going to revolt, form guerrilla groups (which have absolutely nothing to do with me) which strike in the middle of the night, putting back all the “Stand on left / Walk on right” escalator signs. In the mean time, if you’re standing on the right on the down escalator and you hear the rapid heavy thump thump thump of footsteps coming down from behind you, I’d advise you to get out of my way, as I’m rushing for a train. Lady with white stick and matching white iPod earphones walking down Manchester Lane. Maybe she can smell the cars coming. 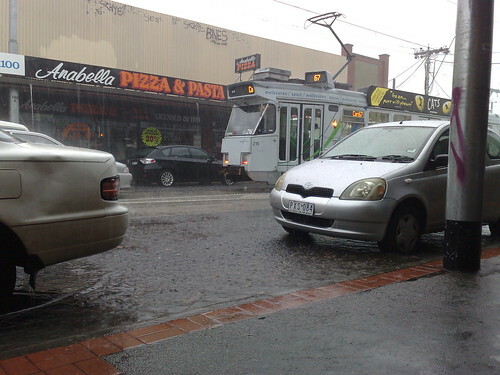 Is it unmanly of me to get the umbrella out for the three-block walk from the station to work if it’s drizzling?